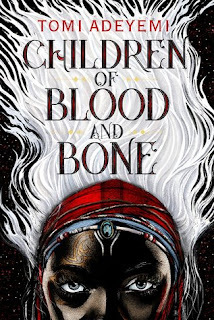 Children of Blood and Bone is a fantastic work of art brought into existence by debut author, Tomi Adeyemi. The story follows Zelie, who watched her mother (and many others) attacked and killed by their nation's monarchy because of the magic that the maji were able to wield. The day that Zelie's mother died was also the day that the powers of the maji themselves all but vanished. Years later, Zelie happens across a runaway princess who literally holds one of the keys to restoring magic to the world. Zelie, her brother, and the princess form an unlikely trio as they quest not only to save their land, but also flee Prince Inan who is determined to kill Zelie, and as a result kill magic once and for all. From the first page, the words "cinematic" and "evocative" popped into my head as I read this book. Ms. Adeyemi writes viscerally, and thus transports the reader almost immediately to Orisha, the land that our heroes are desperate to save. The story shifts between three perspectives. We follow the plot alongside Zelie, Amari, and the villain, Inan. Ms. Adeyemi deftly weaves an intricate, adventurous plot seamlessly together through the eyes and experiences of these unique and well developed characters. To be clear, this isn't your ordinary fantasy. Rooted in African mythology, using African language and folklore Ms. Adeyemi has crafted a world wholly foreign to western readers, but the power and purpose of her prose makes our journey through Orisha and these character's hearts nearly effortless and entirely thrilling. It isn't all fun and games either. Sure, there are the traditional stakes often found in young adult fantasy - "save the world". There is even a romance or two. 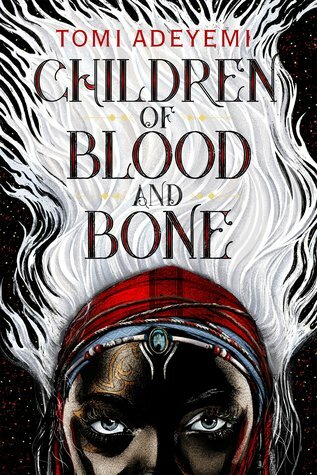 However, Children of Blood and Bone, is an impressively nuanced fantasy story - on par with the great works of its kind. The themes revolve around oppression, specifically the oppression of minority groups - those who perpetuate it, and those who fight to abolish it. Zelie - born in poverty and whose most powerful and influential experiences are painful ones. Amari - a princess, brimming with privilege who chooses to abandon it as best she can in order to foster a better world. Inan - embraces his privilege as a prince, self-loathing, and longs to rid himself of anything that reminds him of who he truly is - violently if necessary. For some this will be just a fun romp filled with magic (we could go on all day about the complex, fascinating magic system), action, and adventure. But the careful, thoughtful, or insightful reader will be rewarded with a truly extraordinary tale that will tug at your heartstrings, open your eyes, and (hopefully) give you the strength to Rise. Love this description, "evocative." A wonderful debut and looking forward to Tomi Adeyemi's next book.